Everyone knows the name Sky and that the brand is branching out in lots of different directions. The reputation and quality of the Sky name is evident within the Sky Bingo online bingo site. This bingo site has a very strong welcome offer for new players that want to try its online bingo offer. The site got something of a makeover in 2016 to make it more modern and colourful – the purple becoming more dominant than the white. At the same time the site adopted the new style HTML5 Playtech lobby and games layout which opens the way for all the fantastic new features such as being able to play in multiple bingo rooms at the same time and opening more than one slot game. The new style also makes all the menu options much more easily located and they have introduced an exclusive 50 ball game – Mystical Bingo, with another new bingo room based on popular itv show Tipping Point. The range of games available is unrivalled and there is something for everyone every single day. 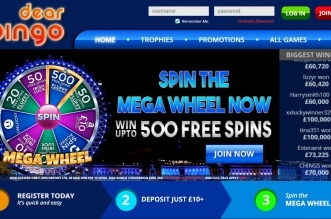 Register a chat name and make a first deposit of at least £10 and spend it on bingo tickets to immediately trigger the welcome bonus worth £30. The bonus comes in two parts. A £15 bingo bonus which can be spent in any bingo room, plus a £15 side games bonus. For July 2017 only you will also be able to claim a no deposit required £10 bingo bonus, which will be released at the rate of £1 per day for 10 consecutive days (this no deposit offer is also available to existing players at the site). The bonus will be available once claimed for up to one calendar month. The lobby is nicely laid out and you choose easily from 90 ball, 75 & 80 ball bingo and specials. Ten 90 ball rooms, four 75 ball rooms, two 80 ball rooms and five specials rooms mean that the selection here is excellent. A selection of exclusive Sky Bingo rooms including Sky Speed and Sky Community means you get the choice whether to play with a large crowd or in more intimate surroundings. 50 ball bingo game only found at Sky Bingo and with a fantasy woodland theme. Everyone can play with just one ticket each and this ticket can be purchased for 25p, 50p, £1 or £2. The prizes will vary depending on how many players in the game and the price of the ticket purchased, but could reach £100 per game. There is also a progressive community jackpot to be won. Each ticket price variant will have its own insect themed character and woodland background for the numbers and the insects/numbers will glow as the game begins and disappear as the numbers are called. Available to play on mobile, tablet and desktop (new lobby only) from October 2016. 40 ball bingo game based around the TV programme of the same name. The balls fall down one of four slots depending on its number 1-10, 11-20, 21-30 or 31-40. The ticket is split into two segments of four numbers each 1-20 and 21-40. You can win a segment and the full house. Launched in February 2017 the game is fast and furious, but at the time of launch there is no progressive game to run alongside the main game. There is a progressive community jackpot however for winning in 12 calls and half goes to the winner with the other half split between all players in the winning game – amount won by each depends on number of tickets held. There is a selection of these games in the bingo section of the site, with more choice in the tabs shown below. However, the bingo slots section is still quite comprehensive in its own right. The bingo lobby has a section for Games and this offers a choice of 96 different games from the Playtech and Eyecon development teams. Play Full Moon Fortunes or Hollywood Boulevard next to Irish Luck or Paradise Reels, play Rich Treats or White Wizard. SkyBET is the brand for Sky sports betting and it may not have a high street presence, but it gives the established bookies and run for their money in the betting options and features. Football and horseracing are the obvious sports and you get all the features like best odds guarantees and early cash out. Plus tabs giving easy access to SkyCASINO, SkyPOKER and SkyVEGAS. The £10 no deposit bonus has a 2x wagering requirement. Once requested it is not possible to reverse a withdrawal. There are no restrictions on the amount that can be withdrawn in any given day or the number of withdrawals. All players spending just £2 a day real cash on bingo will be able to claim a free scratch card – this features loads of prizes and a top prize of £500. Bingo fans will also find plenty of Penny Bingo and BOGOF Bingo at Sky and loyalty pays too with random invites handed out to the Sky Bingo Party room for VIPs – entry is by invitation only. There are also daily promotions available only to Sky Bingo players and many more offers, so be sure to check out the Sky Bingo promotions pages. Sky Bingo Loyalty Rewards – Scheme updated an improved May 2016. Sky Gems gives players more cash or bonus back when redeemed for cash, bingo bonus or games bonus. Automatically get 5 gems for every £1 spent on bingo and 1 gem for every £1 spent on side games. Collect more gems to climb through the loyalty levels which have been given new thresholds for achiveing them. The aim is to provide a more valuable and rewarding scheme. Look for the Rewards Room and look out for the chance to earn triple gems every Thursday. Sky is very active across social media and its Sky Bingo arm is no exception. Facebook: Over 33,000 people can’t be wrong and this is how many ‘Likes’ the site has gathered on Facebook over the years. Check it out here https://www.facebook.com/SkyBingo/ and join their numbers. Never miss a decent game or giveaway and learn all about the big winners and how they are just like you and me – everyday players in the right place at the right time. As well as learning about the best games and when the promotions are taking place you can contact the site with any issues you have encountered and they will usually respond fairyly quickly. Twitter: https://twitter.com/skybingo – active account, but not quite in the same league as the Facebook page. Tend to focus on broadcasting the big networked games and special events in the exclusive rooms. There do not appear to be any links from the bingo section itself on Sky to their social media accounts, although the SkyBET section does feature links to the social media pages for that. You can access Sky Bingo via any mobile device on the relevant mobile browser. The games are fully optimised for mobile play. The layout of the mobile version of the site is nearly identical to the app version of Sky Bingo. Except it doesn’t have the navigation bar at the bottom of the screen. The only place to access Sky Bingo’s sections such as, ‘Bingo’, ‘Slots’, ‘Promotions’, ‘Deposit’ and ‘Withdrawal’ is to go the menu which is located at the top left hand side of the screen. Sky Bingo’s mobile version has all the same games as the desktop version, such as Mystical Bingo, Cash Cubes Bingo and Rainbow Riches Bingo. They all run really well on mobile and may even make you stick to only playing on mobile in the future, as they are so easy to access. The layout of the games are visually great and simple to navigate, which makes Sky Bingo great to play on mobile. Overall Sky Bingo is great to use on mobile, there are only a couple of differences between the app and browser versions, so don’t feel you are missing out on anything when you play on either version. Sky Bingo on mobile is well worth checking out. Sky Bet, Sky Vegas, Sky Poker, Fantasy Football and Super 6 are all available on the mobile version of Sky, all from the same Sky Bingo account. iOS App Store – The Sky Bingo app very closes mirror their desktop style and layout. So if you are a Sky Bingo veteran this will be fairly straight forward to navigate around. The app loads really quickly with no crashes happening during our test. It is best to use this app in portrait mode, rather than landscape, as the app does not scale its layout correctly in landscape mode, which makes seeing vital elements hard to see. The app version of Sky Bingo has a navigation bar at the bottom of the screen, which contents section such as, the promotions, the bingo game lobby and slot games. This helps make it easier navigate from one section of the site to the other, with a simply tap of the screen. Android – Sky Bingo provides an alternative way of downloading the app to your android phone. Simply go to SkyBingo.com/andoid and follow the simple steps to download the app onto your android device’s site on your mobile. You will have remove particular security settings on your android phone/tablet to allow the app to download correctly.